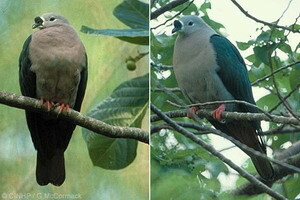 The Pacific Pigeon is the largest forest bird of the Cook Islands. It is dark green on the upper wings and back, with a pale grey neck, head and underside. The adult has a prominent lump on top of its beak. The sexes are identical in appearance. The pigeon has two distinctive calls and many residents believe the calls are gender specific. This article presents detailed observations by Don Organ that support this idea. The Pacific Pigeon has a native range from the Lau Group (eastern Fiji) through Samoa and Tonga to the Cook Islands. It feeds on fruits, especially Guettarda (‘Ano, Guettarda speciosa), Pacific Banyan (Ava, Ficus prolixa), Perfume Tree (Mata‘oi, Cananga odorata), Kapok buds (Mama‘u, Ceiba pentandra) and Cecropia (Rau-Māniota, Cecropia pachystachya). It is present on the Southern Group islands of Rarotonga, ‘Ātiu, Ma‘uke, Miti‘āro, and Palmerston. In the Northern Group is is present on Manihiki and Pukapuka. Why this native pigeon is missing from Mangaia, while it survives on other similarly man-modified uplifted islands, is a mystery. The two calls of the pigeon are: (1) a barking growl "RRRRRRRR", and (2) a rather uniform coo "OOOOOOOOO". Don lives in a house on a slope deep within the Avanā valley on Rarotonga. Around 2pm on a mid-November day in 2004 Don watched a pigeon sitting in a Cecropia tree behind the house, and 3 or 4 other birds in various trees 20 to 50 metres away. The Cecropia bird was bowing slightly as it gave calls of "OOOOOOOOOO" and "RRROOOOOOOOOO". The distant birds gave only "RRRRRRRRRRRRRRRR" calls and were periodically flying to perches nearer to the Cecropia bird. One flew about 50 metres and landed in the Cecropia tree. There was no obvious courtship display nor mating, and the visiting bird then flew back towards its origin point with an extreme wing beat whereby its wings were hitting each other above its body and making an audible slapping noise. Don recalled that sometime during the previous year he had seen a bird making a similar slapping noise as to flew towards and away from a perched bird. A likely interpretation is that the Cecropia bird was a female and the three or four approaching birds were males. If this was correct the males gave only the "RRRRRRRRRRRRR" call; and the female gave only the "OOOOOOOOOOOOO" call, although it was sometimes initiated with a brief "RRRR". Although these observations indicate that the calls are gender specific during courtship, we cannot conclude that they are always gender specific. The author would be most interested to hear what other observers have discovered about the calls of the Pacific Pigeon. McCormack, Gerald (2005) Pacific Pigeon (Rupe) - It's Call. Cook Islands Natural Heritage Trust, Rarotonga. Online at http://cookislands.bishopmuseum.org.